Llanfairfechan Promenade, Where the Snowdonia Mountains meet the Sea. We are on the cycle and coastal path of North Wales. Situated only 50 yards from the safe sandy beach which has a newly constructed launch jetty for small craft. we are overlooking playing greens with outstanding views in all directions. 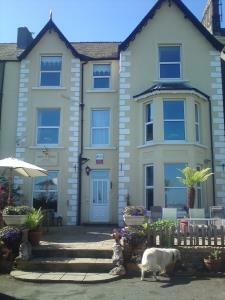 In our unique position, we are perfectly placed for your family stay in Llanfairfechan, We have our own car park, a raised terrace, the perfect place to relax and watch the sun go down over Angelsey. The village is a great place to start walking in the surrounding Snowdonia mountains where you can take in the views of the Irish Sea, The Menai Strait and Anglesey. The seafront has a big open stretch of beach, a boating lake, where again the swans are nesting, bowling & croquet greens a small park with swings and a slide along side a paddling pool. The beach is popular with windsurfers and kitesurfers. It's also a great place to watch the birds over Traeth Lafan, where over the winter months has the largest known population of moulting great crested grebes in Britain. Or you can just have a short stroll and sit on one of the many benches with an icecream and watch the world go by. Our rooms have been freshly decorated and every effort has been made to make your stay with us as comfortable as possible. Each room has a complimentary drinks tray with a Small fridge. They also have their own hairdryers and Luxury Bathrobes. All our rooms have either sea or mountain views. A short stroll to the small children's play area with swings, slide, climbing frame, paddling pool, model yacht pond, tennis courts. And a walk along the promenade to the nature reserve, safe sandy beach. Children welcome from any age. From A55 take junction 14 or 15 into Llanfairfechan. At traffic lights turn down to the beach, follow promenade until you see Min-Y-Don Guest House Sign and Drive into our Car Park. Min-Y-Don is located on the promenade. There are three steps to the terrace and a further step up to the front door. There are no ground floor bedrooms at present. All bedrooms are on first floor with approximately 16 steps/stairs.